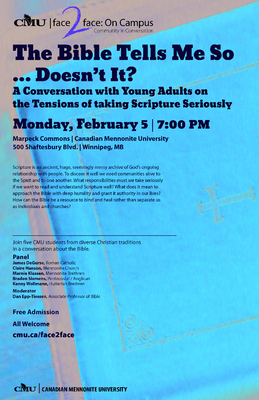 Five Canadian Mennonite University (CMU) students from diverse Christian traditions will participate in a panel discussion exploring the Bible. The public is invited to attend the event titled, "The Bible Tells Me So... Doesn't It? – A Conversation with Young Adults on the Tensions of Taking Scripture Seriously." The discussion will take place on Monday, February 5 at 7:00 PM in Marpeck Commons (2299 Grant Ave.). Admission is free, and all are welcome. "Scripture is an ancient, huge, seemingly messy archive of God's ongoing and loving relationship with people," says Terry Schellenberg, Vice President External at CMU. "To discern it well, we need communities alive to the Spirit and to one another. I'm thrilled by the openness of CMU students to share how the Bible can give shape to their thinking and faith, and their living. Their willingness to be part of a conversation exploring the responsibilities we must take seriously if we want to read and understand scripture well is rewarding." Panelists will discuss questions exploring the assumptions and convictions their respective church traditions have given them to understand the role of the Bible in the life of faith. They will also discuss where they are now in terms of their understanding of scripture as the authority they thought it ought to be, what keeps them committed to reading the Bible, and where they find delight in their interaction with it. Kenny Wollmann, a member of the Hutterian Brethren who is in his fourth year of Biblical and Theological Studies. Dr. Dan Epp-Tiessen, Associate Professor of Bible at CMU, will moderate the 90-minute event, which will include opportunities for comments and questions from the audience. "The Bible is a treasure for the life of faith, but it can be challenging for Christians to unpack its many layers. Sadly, scripture has been used as a tool to divide us on many occasions," Schellenberg says. "I'm looking forward to this conversation that will open us to how the Bible can be a resource to bind and heal, rather than separate us as individuals and churches." "The Bible Tells Me So... Doesn't It?" is the second of two Face2Face events CMU is hosting during the 2017-18 school year. For details, visit cmu.ca/face2face. A Christian university in the Anabaptist tradition, CMU's Shaftesbury campus offers undergraduate degrees in arts, business, humanities, music, sciences, and social sciences, as well as graduate degrees in theology, ministry, peacebuilding and collaborative development, and an MBA. CMU has over 900 full-time equivalent students, including those enrolled in degree programs at the Shaftesbury and Menno Simons College campuses and in its Outtatown certificate program.